Quick weight changes are needed for circuit training workouts that use free weights (such as P90X and ChaLEAN Extreme). Loading and unloading the round plates one-by-one on classic spin-lock dumbbells is slow. Pausing the video to keep up is no fun. Fixed hexagonal dumbbells are fast to change but take up a whole rack. The answer is modern quick-change adjustable dumbbells. Weight changes can be completed in 30 seconds or less. This gives them the space-saving benefits of spin-locks and the quick convenience of fixed weights. However they are usually more expensive, bulky (interfering with full range of motion), noisy (clanking plates) and fragile. Prices of quick-change dumbbells range from $100 to over $500. Examples of brands include Bowflex SelectTech, PowerBlock, Ironmaster Quick Lock, Bayou, Reebok, Gold's Gym, Xvest TurboBells, TITAN, Stamina Versa-Bell, Weider and Lifecore Corebell. Maximum weight is roughly 25, 50 or 100 pounds for each dumbbell; depending on the model. Some models can be expanded to higher weights with an optional kit. 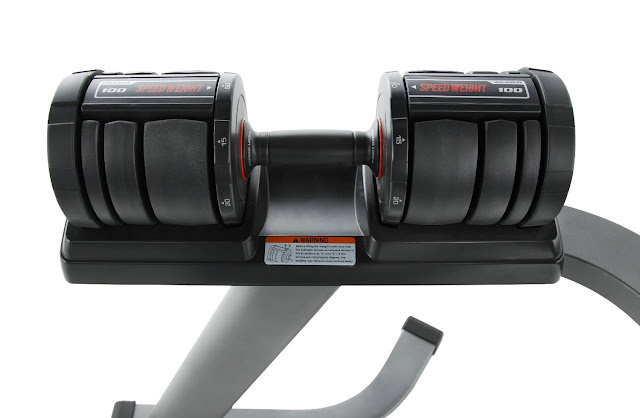 A few manufacturers specify the combined weight of both dumbbells on the box, others specify the weight of one, so there is a possibility of confusion. Some dumbbells are sold singly, not as a pair, which can also cause confusion. Weight increments are usually 2.5, 5 or 10 pounds. Small 25 pound dumbbells have 2.5 pound increments, with heavier dumbbells having larger increments. Wrist weights can be used to fine-tune smaller increments. Quick-change speed. Are there one or two selector controls for each dumbbell? (One is faster.) Is it easy to insert and remove plates or do the plates jam up? Plate rattle. Do the plates bang together and make noise? Safety. Are there any dangerous sharp edges, corners, or pins sticking out? Mechanism safety and durability. Are the plates securely fastened? Can the mechanism be mistakenly partially engaged, allowing plates to fall off in the middle of a lift? Are there any plastic parts that could break if dropped? Length and width. Are the dumbbells fixed length or do they grow with each additional plate? Fixed length dumbbells are bulky even with few weights attached. Balance. Are the dumbbells evenly balanced at all weights? Some dumbbells are asymmetrically weighted for half of all weight increments (say 10 pounds on one end, 7.5 pounds on the other; then 10 pounds on both ends for the next increment; then 12.5 pounds and 10 pounds). Some dumbbells can't be asymmetrically weighted even if desired (say 5 pounds and 15 pounds, useful for some exercises). Double-handed use. Is it possible to hold one dumbbell with both hands? This is required for some exercises. Custom base. Is a special base required to change the weights or will any flat surface do? Dial controls (example: Bowflex SelectTech, TITAN) are the easiest to use. The required weight is selected by turning a dial. An internal mechanism locks individual weight plates to the handle. When the handle is lifted, the unused (unlocked) weights are left behind. Easy to use. No mental arithmetic is needed to calculate the required combination of plates. Dial has to be turned to select each weight in sequence. Ten or more clicks of the dial can be required to reach the desired weight. Complex mechanism might be delicate, easily damaged if dropped. Selector-pin systems (example: PowerBlock) use steel rods to select and hold the plates. The pin or rod is pushed through different holes to select different weight increments. Same change-speed for any weight increment. No need to dial through the whole range (random access). Need to align the pin to the holes in each plate. Some jiggling may be required. Possible to misalign pins during insertion. Quick-release systems (example: Ironmaster Quick Lock) are similar to spin-lock dumbbells. The difference is that a locking nut doesn't need to be unscrewed down the length of the bar. However each plate still needs to be loaded and unloaded one-by-one. Strong locking mechanism, possibly drop-proof. Slower than other quick-change systems, but still faster than spin-locks. Mental arithmetic is needed to calculate the total weight. This is not a complete list of the different types. Other designs and variations are possible. For home gym hand weights, there are many brands. PowerBlock and Bowflex SelectTech are well known. However there are many other brands that could better fit an individual's requirements. Different brands can vary greatly in cost, ruggedness, speed and bulk. Some effort spent on research (using the considerations listed earlier) and reading user reviews on the Internet, can prevent a serious case of buyer's remorse. Home gym weight machines should also be considered.